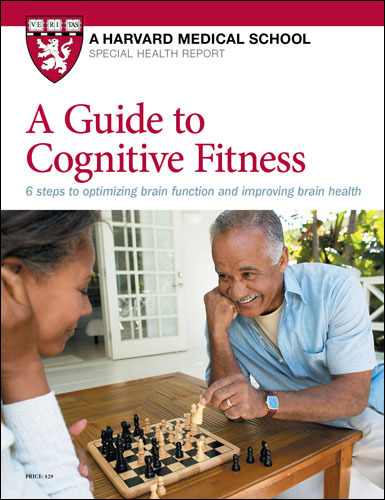 created to help you achieve a lifetime of robust cognitive fitness! As we grow older, the goal isn’t simply to reach our 80s or 90s, but to remain mentally sharp throughout the process. The good news is you can! Research is proving there’s a lot you can do to keep your brain healthy, lessen the risk of brain disease, and stay cognitively fit for a lifetime. Six steps for brain power that goes the distance! This Special Health Report will introduce you to an empowering six-step program that can make a lasting difference to your future. Taken together, these steps can strengthen your intellectual prowess, invigorate your memory, and protect the brain-based skills essential for full, rewarding and independent living. ORDER NOW for a 30% savings…and a 100% satisfaction guarantee! …recapture needed sleep…and release unwanted stress. With age, you may find it harder to get the sleep essential for memory. Chronic stress can have damaging effects on key areas of the brain. This Special Health Report provides explicit, winning strategies to resolve your issues with sleep and stress. …stay connected…and challenged! Steady social contact protects cognitive function as you age. Intellectually challenging activities keep your brain agile. This Special Health Report is packed with ideas for building strong social networks… for constructing rigorous mental workouts… and more! Don’t wait! Send for your copy of The Guide to Cognitive Fitness now! the one part of your brain you want to shrink—and why!